This photo and the story below it contributed by Jim Williamson. A story I was told about my Grampa... He worked as a Fireman at the Boag in the 1940's. On the night shift he would take the family dog Monty with him. I'm told Monty was a very intelligent dog and when my Grampa went in to the main building Monty would switch the light on as he went in, and off as he went out. The light switches being located on the skirting board. I remember as a child wondering why some silly person had placed them there, never did find out. Anyway, one night on the way out Monty stood in front of my Grampa barking and would not let him pass. A few seconds later one of the metal rings that went round the chimney fell to the ground, and would almost certainly have killed my Grampa had Monty not stopped him leaving the building. Sadly a vehicle ran over Monty's paw at the bottom of the hill, by Scott's shop, and unlike today where they would have removed the paw, he was put to sleep. This photo is believed to have been taken in 1942. All the children have been identified as follows: -On the wall - Monty the Dog (Jess), Harry Anderson, Jim Milligan, Donald Harvey, Tom Henderson, Willie Milligan, Joe Brannan and Davie Murray. Standing - Isobel Milligan and she is holding Rosie Milligan, Ellen Ward with Rhoda Freda Price in front of her, Jan Murray, Jean Henderson, Myra Milligan, Andy Milligan, Margaret Henderson and she is holding Jackie Milligan. 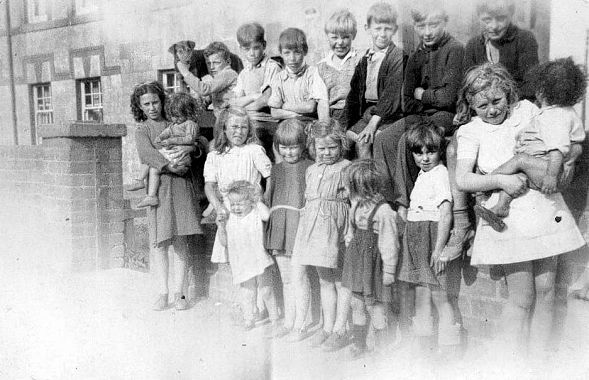 Contributed by Jim Williamson (our thanks to Eleanor Jamieson of Maybole for identifying these children).